Georgia is implementing the student growth percentile (SGP) methodology. SGPs describe the amount of growth a student has demonstrated relative to academically-similar students from across the state. Growth percentiles range from 1 to 99, with lower percentiles indicating lower academic growth and higher percentiles indicating higher academic growth. With SGPs, all students – regardless of their achievement level – have the opportunity to demonstrate all levels of growth. How is the GSGM utilized? The core purpose of the GSGM is to provide students, parents, educators, and the public with valuable, actionable information on students’ academic progress. 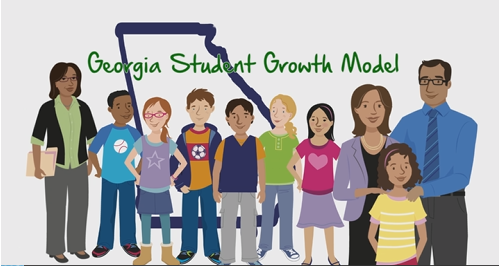 The addition of student growth data to existing student achievement data paints a more complete picture of the achievement and progress being made by Georgia’s students. Students and parents receive student growth reports that provide information on students’ academic progress and achievement. Students and parents can work with their teachers to better understand student performance and the support or enrichment opportunities that might contribute to them meeting or exceeding academic expectations. The public has access to district and school SGP data through the SGP data tool located on this page. Educators have access to detailed SGP data for their students through the Statewide Longitudinal Data System (SLDS). They can utilize SGPs, in addition to other information about student performance, to improve student learning, instruction, and educational programs. SGPs also contribute to school and district accountability. SGPs are used as a measure of student progress in the College and Career Ready Performance Index (CCRPI). SGPs are combined with other measur​es to provide an overall indication of school and district effectiveness. Please see the Accountability page for more information.